On these cold winter days I look for reasons to keep moving just to stay warm. I also gravitate toward comfort food. I've been enjoying my foray into the world of winter salads but at 27 degrees I want a hot meal. This is one of those dishes that's versatile enough to handle most left-overs, so feel free to change up the veggies, take out the meat or change the spices. I took stock of what I had and decided that curry seasoning was the way to go. If you have to cook meat or veggies, start there, otherwise make your quinoa first because the rest goes together quickly. 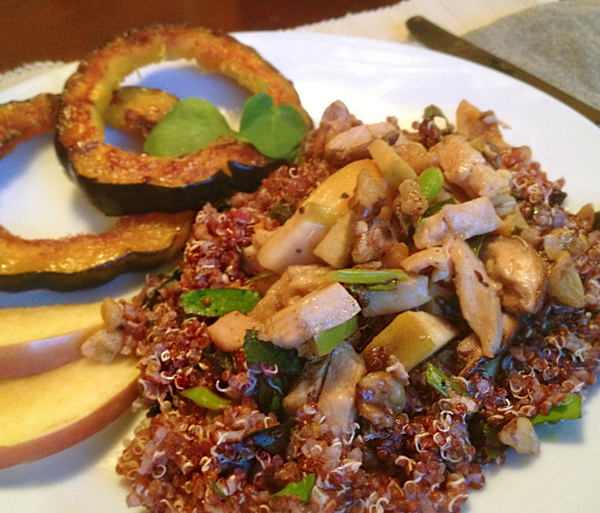 A word about Quinoa: My friends know that I don't make rice. That is to say that I don't make edible rice. It's taken me 20 years to walk away from the prospect of perfecting it and find other options. Quinoa (pronounced KEEN-wah) is my favorite. It looks like a grain but it's actually the seeds that we eat. It's full of fiber and protein but the texture is the best part of it to me. When you bite it there's a gentle pop. If you're trying it for the first time, I encourage you to visit the bulk food aisle and buy just what you need. Try the white and the red varieties. I got this at Market of Choice and was glad to see that it comes from Eugene's own Hummingbird Wholesale. 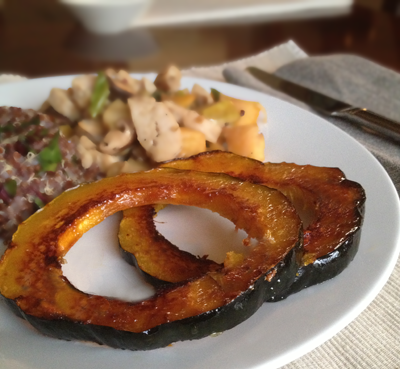 I served this with Honey-Ginger Glazed Acorn Squash and apple slices. I don't remember where I learned about this glaze but it was simple enough that I haven't written it down until now. There's always honey, vinegar and a spice. In this case, I made it to compliment the Curried Chicken and Vegetables over Quinoa. I chose rice vinegar and ginger but the combinations are limited to your imagination. I've used apple cider vinegar and cinnamon to serve with pork. Maybe you'd like balsamic vinegar and nutmeg. If you have another combination, please share. I'm really enjoying experimenting with winter salads. Beets have become a staple in them. 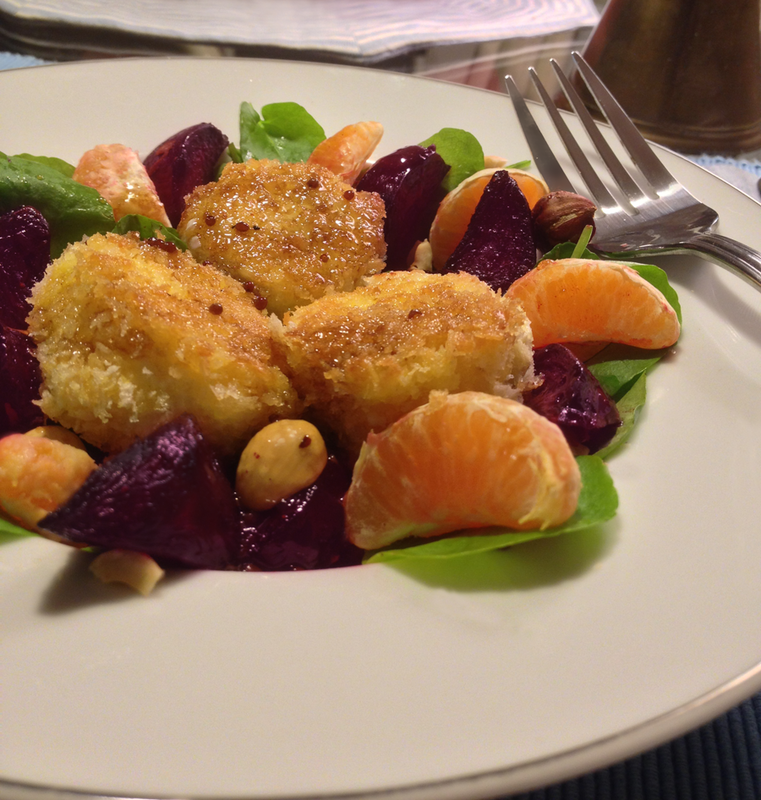 This time, I put roasted beets and clementines on a bed of upland cress. Here in Eugene the stores are selling it as watercress -- it's not. The leaves are delicate and peppery, like watercress, but milder. You can buy it, roots and all, and keep it in a cup of water. I've been harvesting it like basil; the bigger leaves get snipped and allow the small ones to keep growing. I've had this one since mid- December and it's doing great. Since it's been so cold I warmed it up by adding fried chèvre and a warm maple vinaigrette. The toasted hazelnuts added some crunch. I hope you like it. 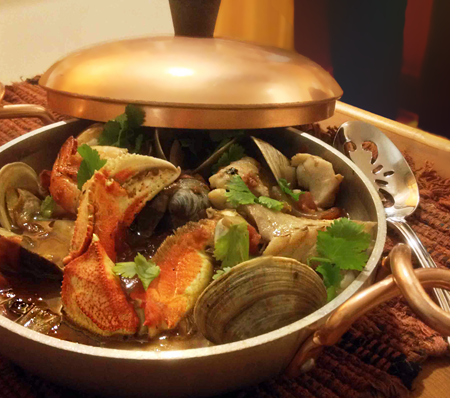 It's crab season and that means it's time to make cioppino! This year I went to the Oregon coast to visit friends and sample the local seafood and wine. While the pot simmered we started talking about the origin of cioppino. I was under the impression that the soup had its origins in San Francisco and was named by the Italian fishermen who settled in North Beach. Someone else thought Portuguese fishermen came up with the recipe. After doing a little research I learned that both cultures have a claim to this tasty stuff. In fact, so does any other fisherman who ended up on the wharf in San Francisco! Whatever the nationality of the fisherman, the story goes that they used to make the soup on the boat. Since there was no refrigeration, canned tomatoes and whatever fresh vegetables they had on hand were the base for this soup -- and that's what I love about it. You can always mix and match the fresh seafood depending on your taste, budget or availability. As long as the tomatoes, garlic, wine and spices are available, you can make cioppino! I guess the conversation about the origin of cioppino will go on as long as there are food bloggers keeping it alive. As for me, I like the way the folks at foodtimeline.org summed it up, American cioppino is a story of immigration patterns, ethnic heritage, and local adaptation. So, from the sunny Oregon coast, here's my local adaptation. Next time you buy beets, don't throw away the tops, try this instead. If, like me, you are inexperienced at sautéing greens, this recipe could be a first step. Beet greens seem hardier and more able to stand up to heat. In other words, they're hard to screw up! That was enough to get me to try them. 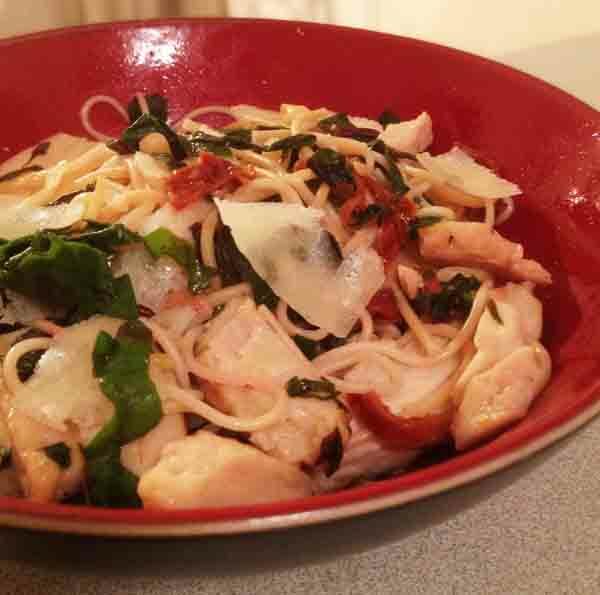 I decided to use them in this quick pasta dish instead of spinach. What a difference, I like them a lot better. I haven't written a recipe for this meal before now, so it's nice to finally write it down. These days, I'm making it with an emphasis on the chicken rather than the pasta but you can easily change the proportions. The trick is to reserve some of the pasta water - you may need the extra moisture. I hope you enjoy this one; it'll help you use up some left-overs and it's healthy to boot! 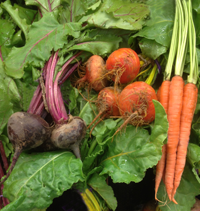 Until I decided to try making salads with winter vegetables, I wasn't crazy about beets. In fact, I wasn't a fan of carrots and I don't remember ever tasting a rutabaga. When I saw this display of organic root vegetables, I knew I had to try to add these seasonal veggies into my winter meals. Now I'm a convert! 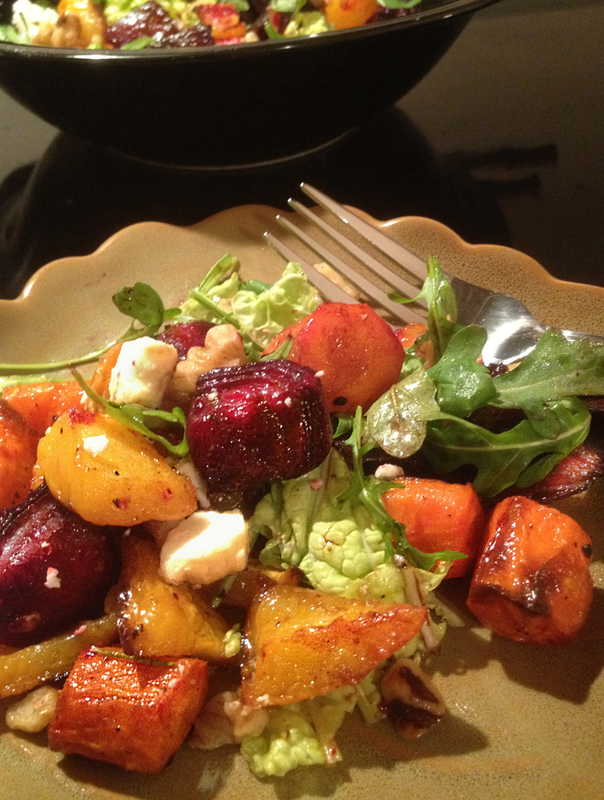 The first time I had roasted beets in a salad I was surprised - they were a lot better than I remembered. So, I picked up some beets, carrots and a rutabaga and started experimenting. The result is this colorful, nutrition-rich salad. Since I used nuts and cheese as a garnish, I figured I was getting enough protein, so it was a meat-free meal. Happy new year! I love the endless celebrations but I'm ready to lighten up the meals and lose those holiday pounds! Besides, I really miss fresh salad. It's senseless to buy the flavorless greens and tomatoes that are generally available so I've been experimenting with winter salads. The whole idea of a winter salad is new to me but, so far, I like what I see. I've been using vegetables as the base and adding micro greens as a garnish. 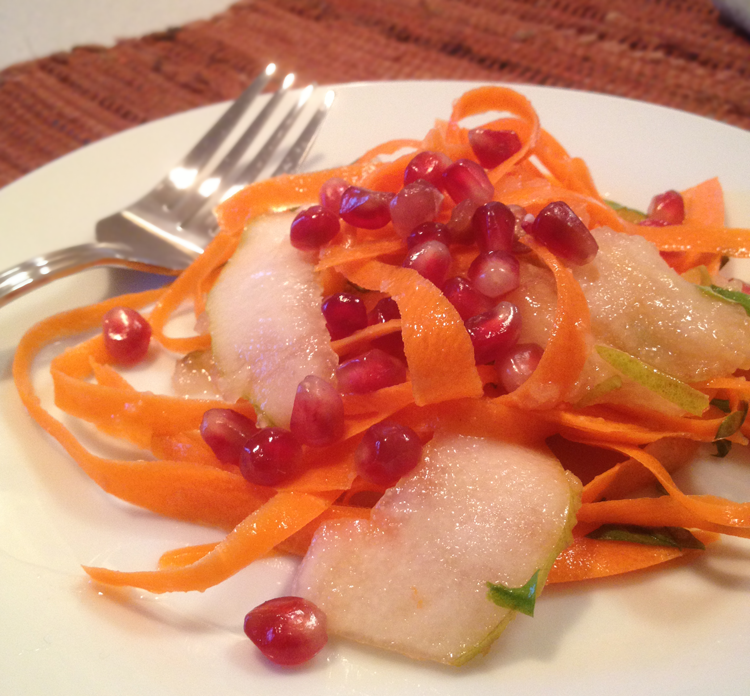 This carrot and pear salad was just right with the pomegranate vinaigrette I concocted. I hope you like the salad and enjoy the bounty of this winter.